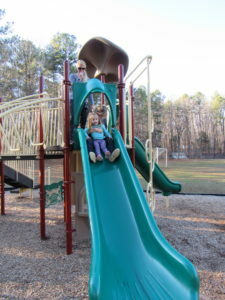 Not long ago, Ashley Lux watched as her daughter Haley, 7, held onto her sister Grace, 2, as they went down a slide at North- west District Park in Siler City. The two children then ran off to the pretend “store” — where currency was mulch and the products, well, you couldn’t see them, but they were there — on the park’s playground. Ashley watched as she talked about how much her family used the parks, when it was warm, at least. It was a chilly winter after- noon as she spoke about the state of parks in Chatham County. Maybe she knew, and maybe she didn’t, but both the Town of Pittsboro and Chatham County governmental entities are already ahead of Lux’s desires for parks services where her children are growing up. Grace Lux, 2, of Pittsboro smiles at the camera before she and her sister Haley, 7, go down the slide at Northwest District Park in Siler City. Mother Ashley looks on. Pittsboro, where Lux and her family live, is in the “wrap-up” stages of its parks master plan, according to Parks Planner Paul Horne. 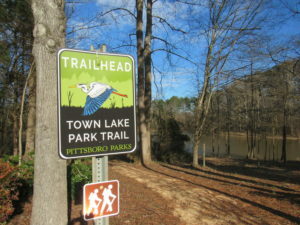 The town held a parks forum in April 2017 to receive community feedback, with one of the major elements desired being walking and biking trails. The draft plan says that desire is in line with national trends, something Horne echoes. He said that greenways and walking trails add health, transportation and economic benefits to the surrounding area. The current plan is available on the town’s website, with the final plan to be presented to the town board of commissioners sometime this year. Chatham County is farther along in its Comprehensive Master Plan for Parks, Recreation, Greenways and Blueways, having asking residents to weigh in on the five proposed vision statements for its master plan by Jan. 25. Based on an August 2018 survey of 312 county residents, 43 percent of county households have used county parks in the last 12 months. Forty-six percent said they’d use a walking/jogging track, and among the most important additions, 38 percent listed natural trails and 25 percent supported the construction of greenway trails. “It is used to help anticipate and plan for future needs based on population projections,” she said. The plan is in the final stage of editing, Burnett added, and will be presented to the Chatham County Board of Commissioners for adoption on Feb. 18. Both county and town residents indicated in very certain terms they’d support new parks. According to a county survey, 72 percent of residents are somewhat willing, willing or very willing to pay entrance fees or user fees to use the parks, while 64 percent are willing to pay increased taxes to support development of new recreation facilities in the county. “These results are typical of communities who support the parks system and believe quality parks contribute to a greater quality of life,” Burnett said. A similar survey in Pittsboro led to similar results. Ninety-eight percent of those polled said they’d be willing to pay an additional $1-3 dollars in taxes per month to support new parks, while 57 percent said they’d pay $8-9 a month more. Both Horne and Burnett said their respective municipalities will likely need to acquire more land for parks based on projected population growth, mainly due to the Chatham Park development. 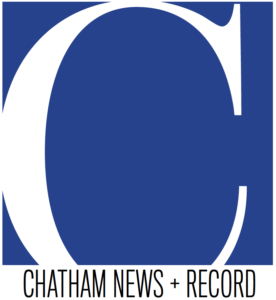 Chatham Park itself had the location for its first park approved at the Jan. 14 meeting of the Pittsboro Board of Commissioners. Vineyard Park, a 10-acre neighborhood park that will be part of Pittsboro’s system, will include multiple play spaces, a splash pad, dog park, multi-purpose play field and a 0.3-mile walking trail. Horne said he’s encouraged that public surveys have shown support for park expansion because such expansion leads to better quality of life. He said parks contribute to the “triple bottom line” — the social, environmental and financial performance of a community — pointing specifically to the social aspect. “Connections between fellow community members is not only important socially but builds stronger community cohesion,” he said. As both the county and the town push toward more places for residents to walk, play and connect, he said, he’s excited about the ramifications.